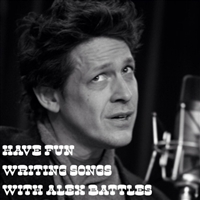 In this course, students will learn the songwriting theories of local songwriter Alex Battles. Each week, students will discuss their favorite music followed by a session in which they will create some of their own. The only musical requirement for this class is the stated desire to sing an original song to another person. Students will be welcome – but not required – to share their creations with each other in subsequent weeks. Each week, students will be required to bring a writing implement they enjoy utilizing, as well as a paper tablet or notebook of their choosing. Musical instruments of any type – other than the human voice – are not necessary for this course. After the first week, students will be welcome –but not required – to bring instruments for self-accompaniment of newly created works.